I haven't read all of Bob Graham's picture books, but I think I have read enough to say two pretty definitive things about him: Graham is one of the few contemporary author/illustrators I can think of who frequently sets his stories in a multicultural, urban environment and Graham can tell a story with emotional heft while making it relevant to his young audience. Examples of his superlative storytelling skill can be found in his picture books How to Heal a Broken Wing, April and Esme, Tooth Fairies and now A Bus Called Heaven. 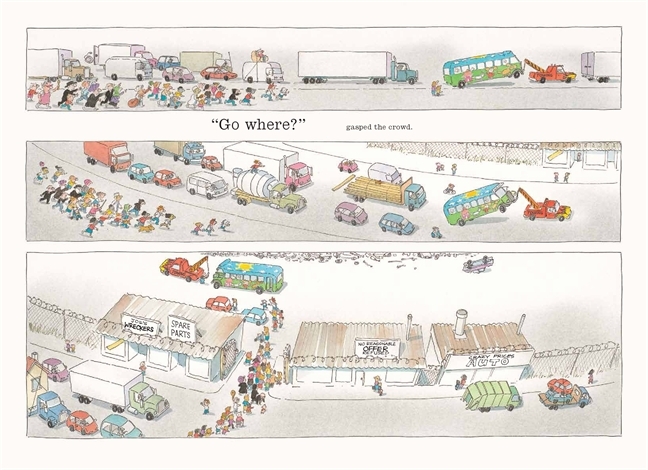 Graham likes to start and end his books with poems and A Bus Called Heaven is no exception. where no bus should be. held down with packing tape. The story begins, "The bus brought change to Stella's street. Traffic slowed where not traffic had slowed before. People stopped and talked together - just a little, but they talked. Stella changed, too." Neighbors come out into the street to see what this bus is all about. Not only does Graham show neighbors of every color, but he makes sure to have neighbors of every religion (that can be determined by dress, anyway) as well. Little Stella, who is "the color of moonlight," decides that the bus could be "ours." From that moment on, the neighbors work together to push the bus almost all the way into Stella's driveway, to clean it, paint it and fill it with nice things. When a gang is caught tagging the bus that night, Stella's mom and dad invite them pack to paint the bus properly, and it becomes a colorful delight. The bus becomes an impromptu community center where women drink tea and chat, old men play checkers, kids play with each other, people read books and teenagers (and Stella) play table soccer. However, the harmony doesn't last long. Against regulations, the bus sticks out too far onto the sidewalk and the city has it towed away. One great illustrations shows the priest, the rabbi and the imam, hands clasped, as the bus is attached to the tow truck. The neighborhood follows the bus through the streets as it is towed to the junkyard. Just when all seems lost, little Stella speaks up, asking the tow truck driver if he will play a game of table soccer with her, saying, "You can have the only goalie . . . but if I win, we'll keep the bus." The ending of A Bus Called Heaven is even better than the start. There are so many details, both in the artwork and the story, that I have not even touched on in this review. Graham has managed to imbue this story with many matter-of-fact good things that can be understood on more than one level. This book could (and should) be read over and over to children of all ages. A BUS CALLED HEAVEN. Copyright © 2012 by Bob Graham. Reproduced by permission of the publisher, Candlewick Press, Somerville, MA on behalf of Walker Books, London. I'm glad you posted about this book. I have a feeling I'll be reviewing it on my blog, too! I hope you do! I still want to do a feature on your fantastic blog - sorry I'm taking so long. Until then, to all my readers, check out the great books being featured at storiedcities.blogspot.com/ for reviews of "decidedly urban illustrated and chapter books for children."